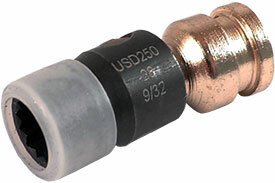 1/4'' square drive low profile swivel 12 point socket with chafe guard. The use of standard swivel sockets may compromise joint integrity, preventing adequate torque from reaching the fastener. Studies have determined that when the swivel angle exceeds 15°, there may be significant 'scatter' or reduction in measured torque valves. from premium shock-resistant 4340 steel and heat-treated for toughness, these no-mar sleeve, anti chafe tools offer top performance and long life. The unique gold and black color scheme makes these quality tools readily distinguishable from traditional swivels.